Peter Bradbury, an ambassador for the Cornwall Air Ambulance was the special guest at a celebration assembly held at Sandy Hill Academy on Wednesday 20th March. Year 5 Katelin, Year 2 Elsie and Year 1 Jago, along with Head of School Miss Helen Bingham, presented the Duchy’s much-loved charity with a cheque for £2,207, the result of fabulous fundraising for the ‘New Heli Appeal’. 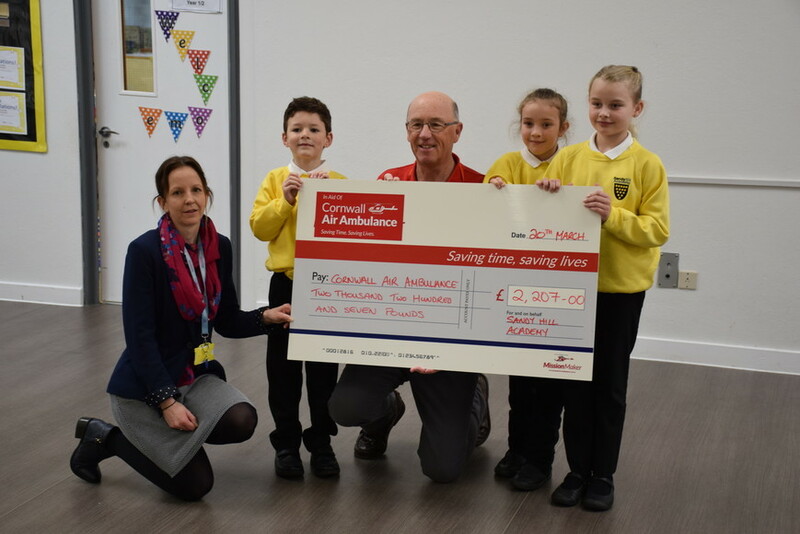 It is a charity everyone at Sandy Hill holds dear as back in the summer of 2018, the Cornwall Air Ambulance was deployed to the school when a young pupil suddenly fell seriously ill. Thankfully this story had a happy ending so as a big thank you, the staff and children organised a sponsored danceathon and fundraising non-uniform day on 28th February. From the little ones in the nursery to the big ones in Year 6 (and the even bigger ones in the staffroom), each class took it in turn to dance non-stop for 20 minutes, cumulatively boogying and bopping away a whole morning! Across the school, the children also gleefully ditched the yellow jumpers for the day, in return for a small donation. This extra ‘bonus’ has now allowed Sandy Hill Academy to stake its claim as a New Heli Hero. The school’s name will appear on the livery of the new Cornwall Air Ambulance helicopter when it comes into operation in 2020. Head of School Miss Helen Bingham said, “The original plan was to raise £500 for the New Heli Appeal but, as usual, the friends and families of our pupils pulled out all the stops and raised a phenomenal £2,207. Having seen, first-hand, the incredible Cornwall Air Ambulance in action, we are delighted to be able to give something back to such a vital local charity.